Background: Halogenases are involved in the halogenation of secondary metabolites with pharmaceutical relevance, such as the antibiotics chloramphenicol and vancomycin. Hereby flavin- or FADH2-dependent halogenases represents the major class of halogenases. Previous investigations on flavin-dependent halogenases have focused on Actinomycetes and sponge-associated microorganisms. In order to extend our knowledge on the diversity and distribution of halogenases we have applied a PCR-based screening approach to show the wide distribution of flavin-dependent halogenases in metagenomes of microbial communities from different environments, such as soils and sediments. Methods: For the screening of new flavin-dependent halogenases a metagenomic approach was used. Metagenomic libraries were constructed and screened by homology-driven PCR based on degenerate primers designed from known flavin-dependent halogenases. 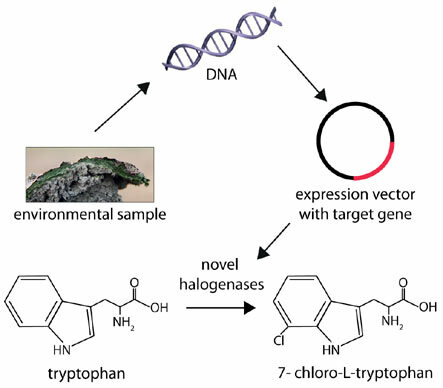 Results: We screened 55 environmental samples that we collected from different habitats by a PCRbased screening for novel flavin-dependent halogenases. The phylogenetic analysis of the putative halogenases together with the 16S Amplicon sequencing results of the environmental samples demonstrates the wide distribution of the halogenases and the large sequence diversity. In addition, metagenomic libraries were constructed to screen for flavin-dependent halogenases. Conclusion: The metagenomic approach described in this paper is a promising method to explore novel putative halogenases from different environments. Keywords: Metagenomics, FADH2-dependent halogenases, environmental samples, metagenomic screening. Keywords:Metagenomics, FADH2-dependent halogenases, environmental samples, metagenomic screening. Abstract:Background: Halogenases are involved in the halogenation of secondary metabolites with pharmaceutical relevance, such as the antibiotics chloramphenicol and vancomycin. Hereby flavin- or FADH2-dependent halogenases represents the major class of halogenases. Previous investigations on flavin-dependent halogenases have focused on Actinomycetes and sponge-associated microorganisms. In order to extend our knowledge on the diversity and distribution of halogenases we have applied a PCR-based screening approach to show the wide distribution of flavin-dependent halogenases in metagenomes of microbial communities from different environments, such as soils and sediments.